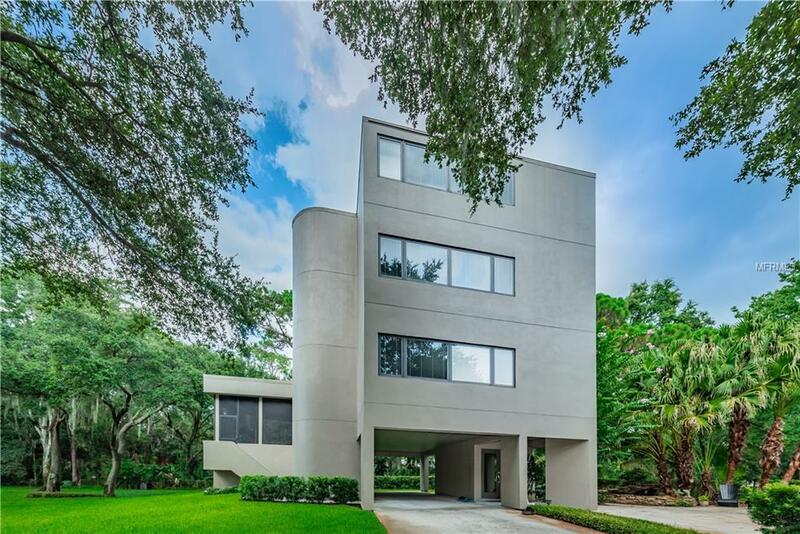 YOUR OWN RETREAT awaits with this IMPECCABLY DESIGNED AND CONSTRUCTED HOME on a TRULY STUNNING 1-ACRE LOT with 4-CAR GARAGE, NESTLED IN PRIVACY yet JUST MINUTES to PINELLAS and HILLSBOROUGH destinations. A LOCATION and SETTING like this is hard to find! HARDWOOD FLOORS are featured along with an Updated Kitchen with SOLID CHERRY WOOD CABINETRY, BREAKFAST BAR, GRANITE COUNTERTOPS, GE PROFILE STAINLESS STEEL APPLIANCES and BOSCH DISHWASHER. Enjoy RELAXING OUTDOOR SPACES on the amazing SCREENED BALCONY WITH RICH WOOD-PLANKED CEILINGS, LOW-MAINTENANCE COMPOSITE DECKING and CURVED DESIGN FOR GORGEOUS PANORAMIC VIEWS or the separate OPEN PATIO COMPLETE with TRANQUIL KOI POND. Desirable OPEN FLOOR PLAN combines Living and Dining areas for comfort and elegance with EXQUISITE TOUCHES including WOOD ACCENTS and DRAMATIC OVERLOOK. Top floor showcases beautiful views, measuring 14 x 35', its perfect for a Large Bedroom or fantastic BONUS ROOM. All PELLA WINDOWS with built-in Slim Shades, NEW ROOF in 2002, NEW EXTERIOR PAINT in 2016, 2 Moose Zon Security Systems and Front Loading Washer and Dryer on Bedroom Level included. This Gem provides a SERENE SETTING with AWARD WINNING GROUNDS with PLENTY OF ROOM FOR A POOL, EXTRA STORAGE, 4-CAR GARAGE WITH LOTS OF POSSIBILITIES for Workshop or Studio plus ADDITIONAL DRIVEWAY BEHIND GARAGE perfect for BOAT or RV STORAGE. NO HOA FEES and CONVENIENT ACCESS to the tri-county area including TAMPA INTERNATIONAL AIRPORT, AWARD-WINNING BEACHES, SHOPPING, RESTAURANTS and more.